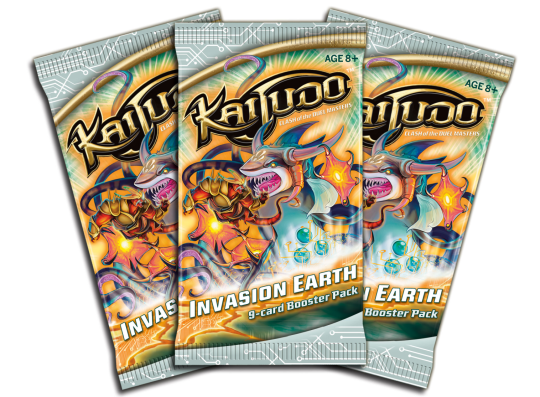 Wizards of the Coast has announced a brand new Kaijudo expansion, Kaijudo – Invasion Earth! The new set will be available at retail beginning Friday, November 8th. The set arrives just in time as The Choten leads his army of corrupted creatures through the Veil to conquer the world and only a Kaijudo Duel Master can stand in their way. The Invasion Earth expansion adds 90 brand new cards to Kaijudo that closely tie-in to the animated television series and gives players a variety of exciting options for deck-building, including powerful new Corrupted Creatures. Two dynamic new play mechanics are introduced along with a new Super Rare foil Monarch card: Almighty Colossus of the Nature Civilization. Taking place on Saturday, November 9th, the Set Premiere is the first chance to crack open packs of Invasion Earth and play with all of the new cards in the latest Kaijudo expansion. The tournament format is Sealed Deck, so participants will be building decks using only the cards found in their booster packs. Winners of each tournament match will win promo card prizes! The Set Premier takes places at local participating stores around the country.